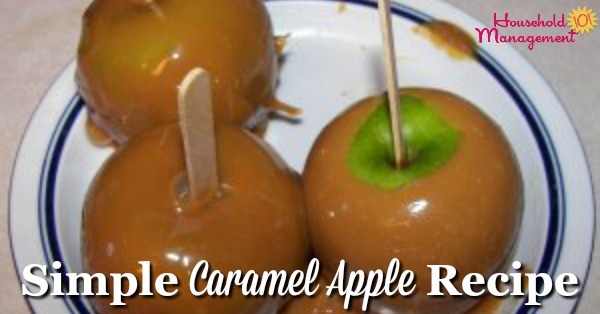 Check out this family favorite caramel apple recipe. My mother-in-law shared it with me, and my kids love it as much as my hubby! This is a great thing to make with your kids around Halloween, as a fun treat. Of course, anytime in the fall, when the apples are at their best, is a great time to make these apples dripping with caramel. You can use any type of apples you like, but my family loves using Granny Smith apples, because they are so tart. It is a great contrast with the rich sweet caramel. 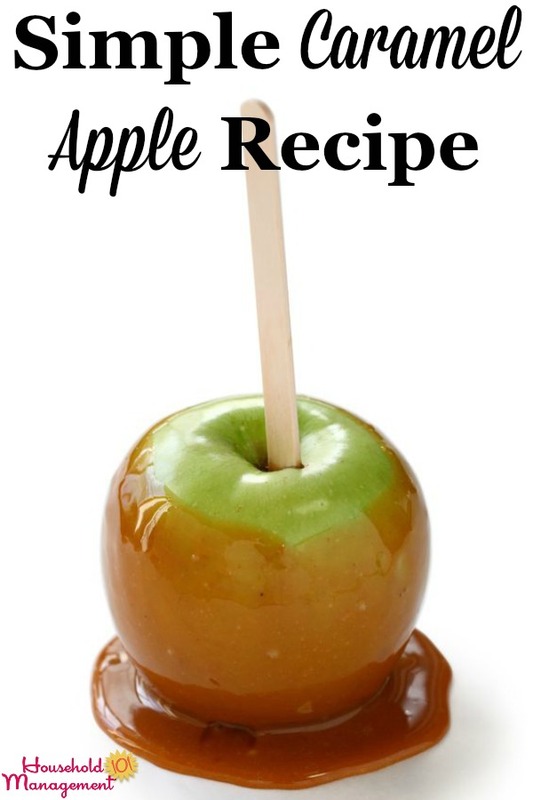 * We use Kraft caramels, but I believe any kind that is hard at room temperature would be fine in this caramel apple recipe. After the apples are washed and dried remove their stems and place a popsicle stick in the center of each one, where the stem used to be. Then, place the caramels, water and 1 tablespoon of butter into a saucepan, on medium high heat until the caramel melts. You will need to stir it constantly, and you can remove it from the heat as soon as it is all melted. 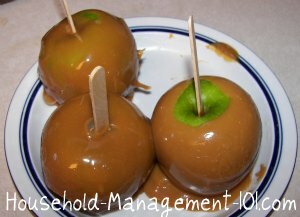 Next, holding the apple by the wooden stick, dip each apple into the caramel to coat it. I tip the sauce pan to the side a bit to get more in one place and then dip an apple and twirl it around to coat it fully. We don't like nuts as part of our caramel apple recipe, but I know many people do. If you want to add nuts just chop them and have them ready to roll the apple in right after you dip it in the caramel, before the caramel hardens up. After dipping in caramel place the apples onto the plate and let the caramel cool and harden. My family can't seem to wait very long, so the caramel is pretty sticky still when we begin to eat them after about 15-20 minutes, but you can let them harden more if desired. 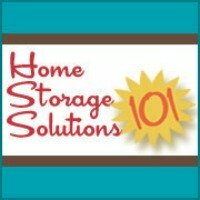 Store uneaten apples in the refrigerator. When you are ready to eat them take them out and let them come to room temperature, so the caramel is not too hard to eat.